Atherosclerosis, or what prevents a long life? Atherosclerosis. The illness of old age? Atherosclerosis — this is the main reason, violates the blood supply to tissues her and organs. There is an idea of sclerosis as a manifestation of old age. Sometimes sclerosis associated with distraction or forgetfulness. Firstly, atherosclerosis may be absent in young and old age. Second, the symptoms of atherosclerosis is much more diverse, because multiple sclerosis may be affected virtually all organs and systems, the entire body from head to toe, as this complex pathological process caused by disorders of the nervous and hormonal regulation of a change in metabolism and the permeability of the walls of arteries. Atherosclerosis — it is a metabolic disorder in the body, in which the increased cholesterol, penetrating the wall of the arteries in the blood. In the wall of blood vessels accumulate cholesterol with subsequent calcification formed either plaques or ulceration them. Generally, the risk of atherosclerosis and increases with age. Atherosclerosis. It affects all the organs and systems. Influence of atherosclerotic changes in the general circulation and blood flow to organs passes Staging. Initially, only a small phase changes in the arterial wall, this effect is minimal; then the progression of atherosclerotic changes, consolidation and violations of the artery walls permeability, this effect becomes more pronounced — broken tissue nutrition, the metabolism is upset in them and their functioning. Then, as a result of chronic oxygen starvation of tissues and disorder in their metabolism, their degeneration begins, grows connective tissue, cirrhosis (necrosis) of tissue. For example, atherosclerosis of the aorta may initially be asymptomatic and detected only when the functional examination. But there may be unpleasant pain in the chest or in the abdomen, often burning, crushing, squeezing character. Often, there is shortness of breath and high blood pressure. Aortic atherosclerosis, along with atherosclerosis of the coronary arteries, often the cause of angina attacks. 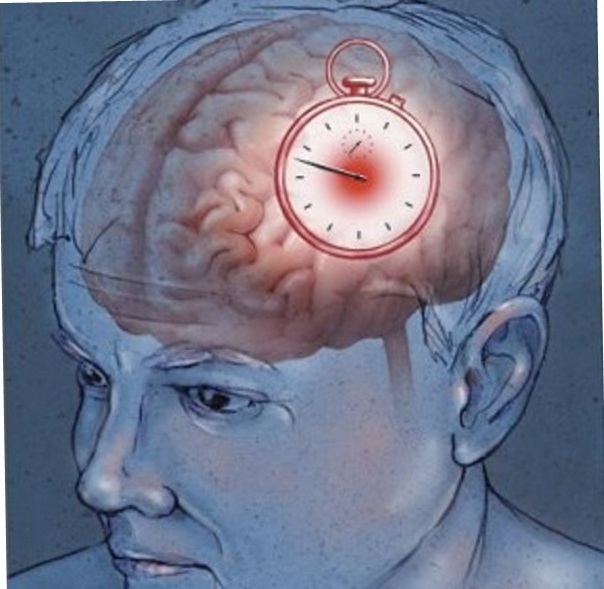 When cerebral atherosclerosis increased fatigue, reduced performance, deteriorating memory, disturbed sleep at night and somnolence during the day, there are dizziness and headaches, noise in the head and ears. Sometimes change or dramatically exacerbated some character traits: Lean is becoming stingy, precise — unbearably neat, «boring», there is crying and suspicion. Atherosclerosis of cerebral vessels in combination with hypertension and elevated prothrombin often complicated by bleeding in the brain (stroke), and, as a consequence, paralysis or death! Atherosclerosis affects, as a rule, and the coronary arteries. This disrupts blood flow in the heart vessels and blood flow in the myocardium, its food and kislorodoobespechenie, thereby developing cardio. As a result of the work of the heart is disturbed: quickens and often disturbed heart rhythm, gradually showing signs of circulatory failure throughout the body — weakness, shortness of breath, swelling of the lower extremities, pain in the heart, headaches. Atherosclerosis of renal artery steadfastly keeps high blood pressure, and there are signs of impaired renal function. Arteriosclerosis of the extremities revealed their seal, crimp, pulse hardness. When sclerosis of the arteries of the lower extremities there are pains in the calf muscles, worse on cooling, while walking (called intermittent claudication — is especially pronounced in smokers this process). In marked sclerosis can occur leg sores, gangrene and, consequently, the amputation of limbs. cases, treatment aims to prevent further progression of the process and improve blood flow to the tissues of organs and systems. overvoltage, disorders of the endocrine, nutritional errors smoking. In addition to atherosclerosis, and often as a consequence of his frequent disease in the elderly — is hypertension, which sometimes starts after 40-50 years and gradually progresses. The disease is manifested by increased blood pressure, headaches (especially in the occipital region), dizziness, pain in the heart, general weakness. Most often, these symptoms occur in the late afternoon. At the time it started, correctly prescribed treatment can stop the progression of hypertension. Atherosclerosis. The investigation of atherosclerosis — coronary heart disease. It is also a consequence of atherosclerosis is coronary heart disease, which can occur after 40 years — in the form of acute myocardial infarction, in the form of angina or in the form of post-infarction or atherosclerosis Cardiosclerosis. Gradually, with time and age for coronary artery disease becomes chronic. It should be noted that the correct and timely treatment can also suspend the course of chronic ischemic heart disease. • regular inspection of the body: ECG, blood pressure measurement, blood test cholesterol and prothrombin, and so on and so forth, and in the case of deviations from normal figures carry out appropriate activities for their normalization…..
Sclerosis is able to develop in the lung tissue — is fibrosis in the muscle Heart — cardio, in the kidneys — nephrosclerosis, bone — osteosclerosis, in receptacles — is atherosclerosis.